The Studio Museum in Harlem called the other day. They carry the book Jazz ABZ in their bookstore and wanted to do a feature in their quarterly magazine. There's an artist interview in each issue and it includes a coloring page for kids. 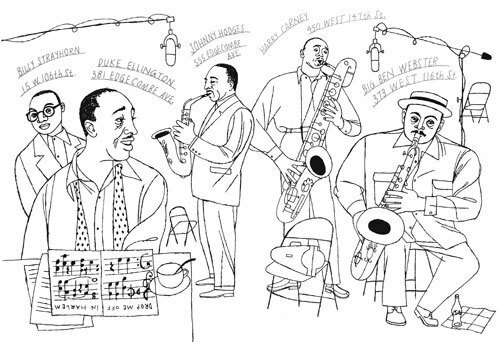 I sent them this line drawing of Duke Ellington and a few cats from his band that made Harlem their home. I have this directory of musicians from 1955 that lists everyone’s home address and I included them in the drawing. The whole thing is a shameless imitation of the great David Stone Martin, and I’m sure the image will be improved by kids with crayons. Would love to see you illustrate a (children's ) book in this style. 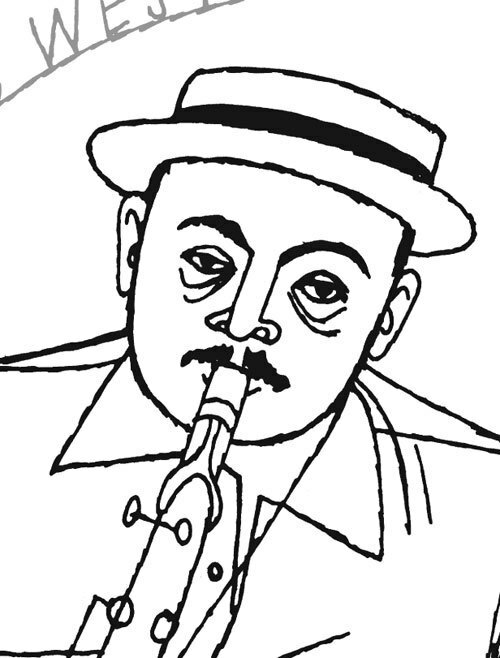 We did a cool exercise once with my kids: We colored with crayons at the beat of jazz. Kids are gonna do wonders over your already wonderful drawings, Paul! Paul, you've got that line work nailed. You shameless boy. A coloring book! Now that to me is a very cool honor. And the addresses are a great idea, especially for NYC kids who might recognize some of the streets and realize these cats used to live in their neighborhoods! Just because you draw a textured line doesn't make you a shameless imitator of David Stone Martin. I get the same effect just trying to draw curves by hand in Photoshop. Beautiful drawing, Paul.